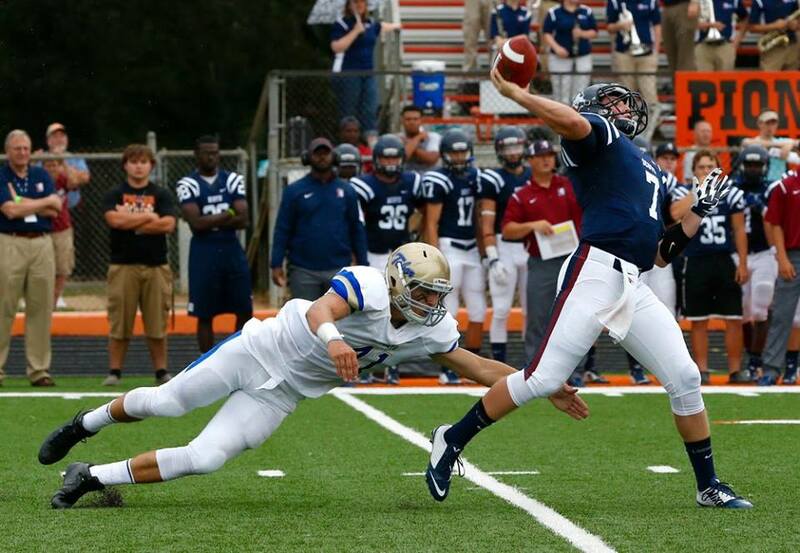 BATESVILLE, AR – Sixty-four years had passed since Lyon College last took the field to play a football game. For at least one half, however, the Scots played like a team that had been there all along. The Scots scored on a 56-yard run by Michael Bowles on their second play from scrimmage and eventually took a 14-10 lead to the lockers against the No. 22 Tabor (KS) Bluejays. But while the Scots played like a team that certainly belongs, reality finally set in as a Bluejays squad that repeatedly shot itself in the foot in the first half came out firing on all cylinders in the third quarter. The Bluejays scored 28 unanswered points in the period to pull away for an eventual 45-21 win despite the spirited effort by the Scots. Known as Arkansas College the last time they took the field in 1951, Lyon folded its football program after that season, and it had remained dormant until Saturday. If a prediction of the future is possible after just one game, however, the Scots – playing with a squad that is composed of 94 percent true or redshirt freshmen – look like a program that could be a force to be reckoned with sooner rather than later. Bowles, a transfer from Arkansas Baptist College, is one of the few upperclassmen on the team, and led all rushers with 231 yards rushing and a pair of scores. Tabor, however, eventually lived up to its preseason ranking, and the second half was all Bluejays. Joseph Donnell was the main key to the team’s offense with 140 yards rushing, but D’Marco Smith added another 100 while the duo combined for four rushing touchdowns in the second half to help Tabor pull away.